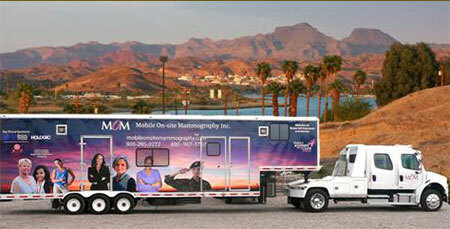 Mobile On-site Mammography is focused on providing the highest quality of Mammography service with our professional experienced staff, using the latest Digital Mammography technology for your safety and comfort. The M.O.M. van is scheduled at various County and City worksites during the months of February and August each year. Check back periodically to see the schedule of on-site locations. Who can participate? All Pima County employees with medical insurance. This service is also open to employees' spouses / domestic partners. How to get started: Call 1-800-285-0272 to schedule your appointment. Please bring your insurance card, your Dr’s name and address, and the location of where you had your prior mammogram films. Additional Information: Insurance Coverage with Aetna, BlueCross BlueShield, Unitedhealthcare, CIGNA, and other select carriers. Non-Insured patients pay $167.00 for 2-D screening mammogram or $217.00 for 3-D screening mammogram (includes the Radiologist Reading). 3D & Full Field Digital Mammography and CAD computerized reading. Aetna now covers 3D at 100%. You will be responsible for any charges that are not covered under your insurance plan. Patients under age 30 must provide a Dr.’s referral. Baseline mammograms recommended at age 35-40, (unless family history or symptomatic)* and most insurance plans cover women every year over 40 years old. They are now able to accommodate breast implant patients. A monthly breast self-exam (BSE) starting in your 20s is recommended so that you become familiar with what is normal for you. If you notice any changes in your breasts, it’s important to schedule an appointment with your physician. "Please keep funding this program. It has already saved several of my co-workers lives. It being convenient helps me do this annually"
"Great staff & facilities. It's great to have the convenience of such an important service." "The best way to get your mamo." "You were right outside my building. I had no excuses not to take care of this."